Over the summer, we finally got around to doing something that had been on our (lengthy) house to-do list ever since we moved in: We got insulation blown into our walls, at a steep 90% discount courtesy of MassSave. At 90% off, you’d wonder what the hell were we waiting for all these years. Well, we had a lot of pesky obstacles to clear before we could get insulation blown in. For starters, our old 1920 house had knob-and-tube wiring when we first bought it. That means there were basically exposed wires running up and down inside the walls. As scary as that sounds, it’s usually perfectly safe — as long the wires don’t come in contact with anything. So stuffing the wall cavities full of insulation is a a big no-no with live knob and tube wiring. BUT, we paid a pretty penny to get that taken care of a few years back, and our electric service is now fully fit for citizens of the late 20th and early 21st centuries. Still, our house has other issues, too, like asbestos-cement siding. 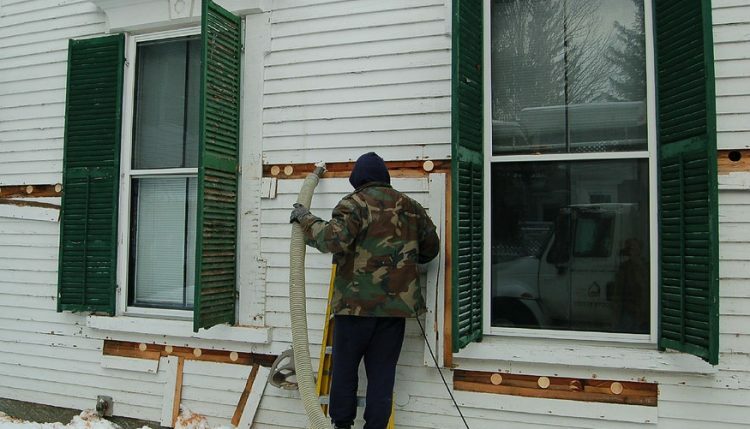 To blow in insulation, the installers generally remove a shingle or piece of exterior siding, cut out a hole that fits a vacuum-style hose, pump the wall cavity full of loose insulation, then plug it up and replace the shingle or siding (and repeat). Add asbestos to the mix, though, and it all gets a lot more complicated, and expensive. We were afraid they’d have to drill up the inside walls, in fact, but gratefully they didn’t have to. Anyway, we own a two-family house, so everything’s more expensive. And the original MassSave deal used to pay for 75% of your insulation costs, capped at $2,000. We knew insulating this big beast, with its brittle asbestos shingles, would cost way more than that, so we kept putting it off. But MassSave had a deal last fall where owners of 2- to 4-family houses could get reimbursed for 90% of their insulation costs, with no cap, if they insulated all the units at once. Sold! So we got an energy audit from MassSave, and they gave us a quote for insulating the walls of both units, plus our attic doorway and the cavities under each attic stair tread. (I had already insulated the attic floor years ago. Not well, mind you, but well enough.) The total quote for both units came out to almost $10,000 — gulp — but we’d only have to pay $990 or so. Amazing. And now that we’re a solid three months into heating season, I finally have enough data to see whether, and how much, the added insulation is saving us on our gas bill. Spoiler alert: It’s a lot! By my calculations, we’ve used 25% less energy this November, December, and January compared to last season. And that’s taking into account the differences in temperature from one winter to another; last winter had some crazy cold spells, so I wanted to be sure our reduced energy use wasn’t just the result of a milder winter. To do that, you need to factor in “degree days” — basically, this is a measure of how far the daily average temperature outside diverged from 65 degrees. Higher numbers mean it was way colder (or hotter, in summer) than 65 degrees, which means you’d have to use a lot more energy to achieve room temperature indoors. So, reviewing our National Grid gas bill, I calculated our average therms per day in November, December, and January for both last season and this one. Then I divided those figures by the average degree days for each month. In 2017-18, we used an average of 0.208 therm per degree day. So far in 2018-19, we’re using an average of 0.156 therm per degree day — exactly 25% less. How much money is blown-in insulation saving us? So how much does that boil down to in dollars? Right now we’re paying about $1.55 to $1.60 per therm, once you factor in delivery charges and other fees from National Grid. And last year, we used about 1,040 therms for the entire heating season (November – April). So if we cut down our gas usage by 25% — or 260 therms per season — that’d be an annual savings of around $400. Not too shabby! Thanks to the financial favor from MassSave, we’ll easily recoup our portion of the cost in about 2.5 years (and that’s without even factoring in any savings from the downstairs unit). But if we had had to shell out the entire 10 grand ourselves, it would take a lot longer to break even. More importantly, to my mind, we’re using that much less fossil fuel and reducing our greenhouse gas emissions. It’s not going to save the planet from our dystopian Waterworld-like future, but at least we’re trying to go in the right direction. Now, getting to that $400-a-year savings wasn’t exactly a walk in the park. The MassSave energy audit was easy, and the application and payment process was all pretty smooth. But the crew who installed our installation (you can choose from a huge list of installers, and we chose a company right here in Quincy) weren’t exactly… meticulous. The lead crew member was really nice and courteous, but he had a cousin or friend or someone on the crew who spent three days literally screaming frustrated profanities outside our windows all day long. It was summertime, so our 6-year-old was home and listening, and anyway it’s not exactly relaxing to have somebody loudly shouting the f-word from a few feet away all day. One reason that guy kept hurling f-bombs was that he kept breaking our shingles when trying to pry them off. So our house is now pockmarked with ugly, cracked-and-glued-back-together asbestos shingles. Now, our house was ugly to begin with, and we’d like to get it re-sided one day anyway, so this isn’t a huge deal to us… but I’ve seen cute houses with asbestos shingles, and this process could really ruin the look of a nicer home if your contractor’s not careful. What’s more, loose insulation is loose. If you have any gaps in your windowsills, baseboards, or anywhere else, it’ll find its way into the house. We were vacuuming up stray insulation in corners, in our pantry cabinets, and elsewhere for a couple of weeks. And then there was The Incident. They vacuumed it up as best they could, but jeez! And from what I can tell, this isn’t even all that uncommon. 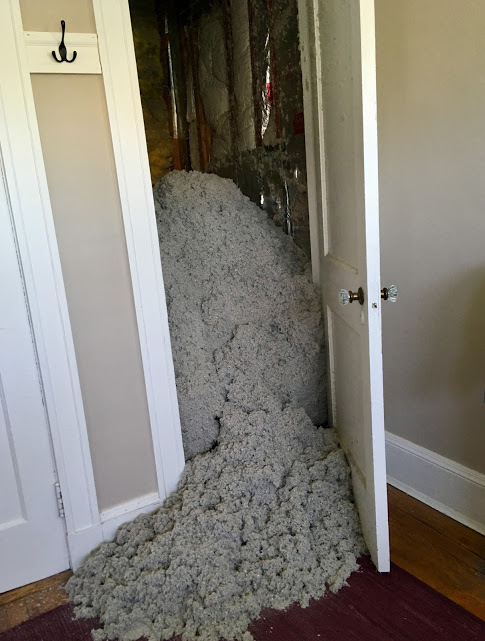 A friend of ours who had insulation blown in years earlier (with a different contractor) came home from work to find a similar scene in his living room — he had removed an outlet cover at one point and had yet to replace it, and a pile of insulation was heaped on the living room floor. Anyway, all that insulation (and God knows what other particles) flying around led to a much scarier incident. My wife was undergoing treatment for breast cancer when all this happened — we had scheduled the work a full three months earlier, long before we knew it would be the Summer of Chemo — and, with her immune system weakened, she got a serious sinus infection a couple days later that required an emergency overnight in the hospital. It’s impossible to prove the two are directly related… but you have to imagine they are. Thankfully, we can laugh about it now, but that was really scary. The long and short of it is: I kind of wish we had gone on vacation or something during the installation, or better yet, done a little more research before choosing an insulation contractor. But, the math proves the savings were worth the cost of blown-in insulation. We’re saving a whole lot of energy (25%) and money ($400/year) this heating season.